Этот текст прислал мне Шон, мой penpal (друг по переписке) из США. Самолет разбился в их районе. The San Diego Fire Department described the scene of the crash as «a heavily populated area» near Interstate 805. Противопожарная служба Сан Диего описала место падения как “сильно населенную местность” вблизи магистрали между штатами №805. TV footage showed plumes of white smoke rising from several houses. Видеозапись показывает облака белого дыма, поднимающиеся от нескольких домов. The Federal Aviation Administration said the jet had crashed as it prepared to land at Marine Corps Air Station Miramar and that the pilot had ejected. Федеральное авиационное управление сообщило, что самолет разбился при подготовке к посадке на авиабазе морской пехоты в Мирамаре и пилот катапультировался. The crash occurred two miles (3.2km) from the base, it added. И добавило, что падение произошло в двух милях (3.2 км) от базы. Personnel from Air Station Miramar, famous for its role in the movie Top Gun, have been dispatched to the crash site to investigate. Личный состав авиабазы Мирамар, известный своей ролью в фильме “Летчик-ас”, был отправлен к месту падения для проведения расследования. The Marine Corps said the jet, a two-seater F/A-18D Hornet, had been on a training mission with only one pilot on board. Морская пехота сообщает, что самолет, двухместный F/A-18D “Хорнет” (“Шершень”) выполнял тренировочное задание с одним пилотом на борту. Mayor Jerry Sanders and a military official sent out their condolences to the families of the victims, whose identities have yet to be released. Мэр Джерри Сандерс и военный представитель выразили соболезнования семьям жертв, их опознание еще предстоит произвести. I have yet to hear Ray’s version of what happened. The bank has yet to respond to our letter. An emergency call was received shortly before the plane went down. Ten men died when the ship went down. Kurt Miller, who lives a few blocks from the crash site, told the BBC he had seen the jet coming in and thought it «seemed a little low». Курт Миллер, который живет в нескольких кварталах от места падения, сказал, что видел приближающийся самолет, и подумал что он “кажется, низко летит”. What time does your train come in? «I did not notice billowing black smoke from the engines or anything, however there were some noticeable fumes, which I originally just thought was exhaust,» he said. There was smoke billowing out of the windows. She was barely aware of his presence. Donny James, who was visiting the area, said the jet had «spiralled out of control, just like out of Top Gun» before coming down. The keys must have fallen out of my pocket. He said he was unable to get closer to the scene because two houses were on fire. One was destroyed and another was badly damaged, he added. «Both houses were totally engulfed in flames. I saw a pilot walking around and he was dazed. The police were telling everyone to get out of the way,» Mr James told CNN. The building was engulfed in flames. Dazed survivors staggered from the wreckage. Debris from the aircraft, including one of its engines, is strewn around the neighbourhood, reports say. Officials have urged anybody who finds any parts to leave them and report them to authorities. She was hit by	flying debris	from the blast. The street was strewn with broken glass. Be quiet! You’ll wake up the whole neighbourhood! I got a note from Moira urging me to get in touch. Witnesses said the pilot had landed in a tree close to the crash site. He was later taken to Balboa Naval Hospital with injuries, officials said. The BBC’s Rajesh Mirchandani in Los Angeles says there have been concerns voiced by local people in the past about the frequency of flights by military aircraft over residential areas in California. The recent rise in crime is a matter of considerable public concern. The senator voiced concern at how minorities and immigrants are treated in California. 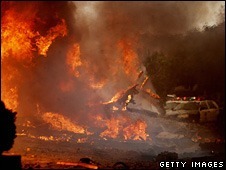 killing three people on the ground and the pilot. Личный состав был отправлен к месту падения для проведения расследования. Personnel have been to the crash site to . Во сколько приходит твой поезд? What time your train ? Обломки самолета разбросаны по соседству. Debris from the aircraft is strewn around .